Here we are, almost at the end of January. How has the month been good for you? Are you still pushing? Are you still fighting to make those resolutions into reality? I am trying to do my best to say “Yes!” to all those questions. This week was a bit harder for me then others. Food wise, not so much. Emotionally though, I was a little down. I’ve had a couple of nights that I felt like I was slipping into my old habits. Last night, I did stay up till 1 am watching the Royal Rumble. I’ve also had the doubts creeping in. Thinking I haven’t been making progress, and not pushing myself like I want to. I had the feelings of being overwhelmed with so much to do. Getting that done, and still feel like having too much to still do. Still, I made progress. That is what really matters. Sometimes, I just need to remember that. I am down another 3.7 lbs this week. I went most the week feeling I hadn’t lost any. I am down 22.6 lbs so far since the first. Can’t be upset with that. 4 weeks ago, I was 367.6. Today I am 345. That makes me feel much better! I had a couple of really low carb days this week. I fought against all kinds of temptations this week, and tackled eating at a restaurant. Luckily, I wasn’t really all that temped my the bad foods. Only 3 walks this week. My goal was 5. Thursday I did make the mistake of leaving my fitbit on the charger all day. I only grabbed it before going out to bowling. 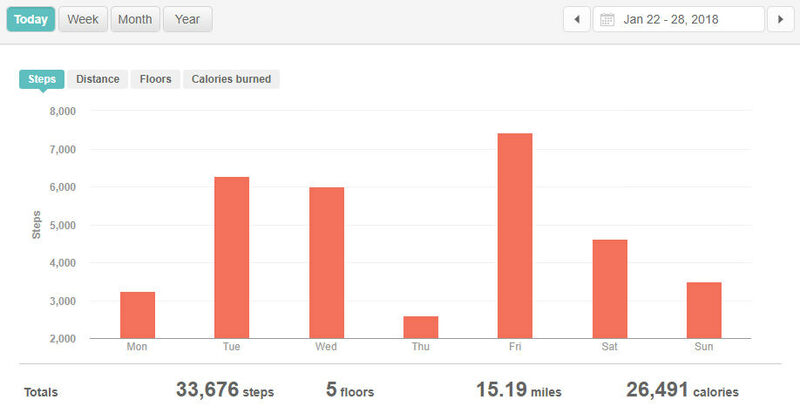 Even with that, this week had the most tracked steps. This coming week, I will focus more to get in 5 walks. A few times this week, I have been feeling like my old late night habits want to fight back in my life. Twice, I didn’t read. Last night I stayed up till 1am. So not exactly what I like to see. Also going to work on this more this coming week. Hopefully, the new bed will be here soon. Make sure I stay on track with food. Get in my exercise. Get sleep in. We have just a few more things to work out for my trip to NYC in a couple of months. The summary next week will have my body measurements included. Back at it in the morning!